Three plus years...as the late Jerry Garcia once sang: "What a long, strange trip it's been." 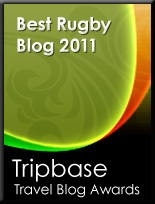 All I know is that the Rugby Blogosphere has allowed me to share opinions and stories about rugby. Your blog is an integral part of my reading. Keep up the great work. I bet you never imagined how many people in so many places would follow your blog. Personally new to this blogging lark as well and I more or less agree with what you've said about why you blog. Enjoy what I've read of your posts so far & look forward to reading more. I have just started a general sports blog, The Sporting Wag (thesportingwag.blogspot.com), mainly because I like writing & I wanted to provide friends with an alternative view of watching sport in the UAE. I think that's blogging in a nutshell, your chance to be the person expressing your opinions on things that matter to you. I've set up my own blog http://scrumdownliverpool.wordpress.com to look at coaching issues affecting Liverpool based rugby teams and that's basically the essence of blogging, you giving your opinion on something that matters to you so keep it up!